Creative Industries Fund NL is calling on designers to submit a proposal for participation in the 16th edition of the Venice Architecture Biennale, which is being held from 26 May to 25 November 2018. 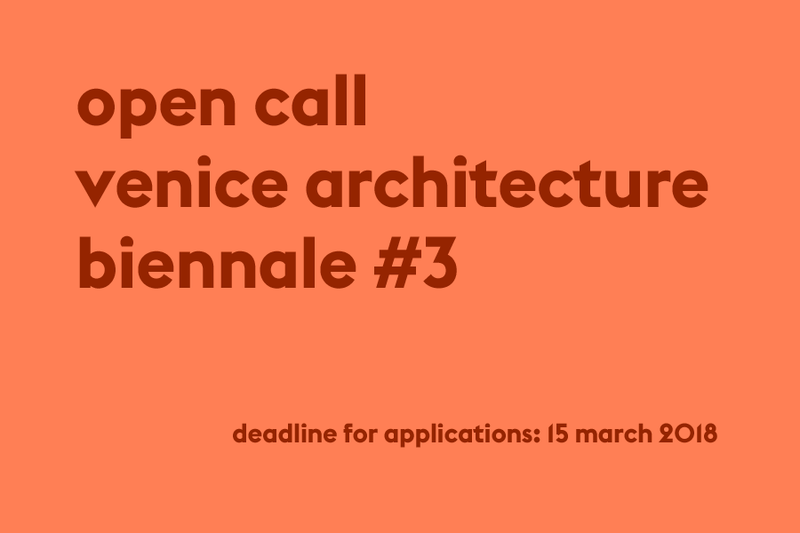 This third and last Open Call invites researchers and designers in the field of architecture to submit proposals for the presentation of initiatives and projects that make a meaningful contribution to the programming of one of the main venues, such as the Arsenale, the country pavilions in the Giardini, or another suitable and prominent location in Venice. Under the title FREESPACE, general curators Yvonne Farrell and Shelley McNamara are utilizing this Biennale to address the relationship between architecture and society. To read the press release about the FREESPACE theme, click here. A precondition for this Open Call is a detailed motivation from an inviting party and/or curator. The presentation budget is intended for travel and accommodation expenses as well as transportation and presentation costs for projects with which the applicant makes a meaningful contribution to the exploration of the FREESPACE theme during the Architecture Biennale in Venice. In this way, the Fund is providing support for designers and researchers to participate in activities that are being held during the preview days on 24 and 25 May 2018 or being organized in the context of the Biennale from 26 May to 25 November 2018, such as exhibitions, performances, events, symposia and expert meetings. Applications for the set-up and development of group presentations or group exhibitions are not eligible for support. A maximum budget of €25,000 is available for this Open Call. The Fund expects to support a minimum of 10 proposals. The grant has a maximum of € 2,500 per proposal. Projects that receive a grant under the Open Calls Venice Architecture Biennale #1 or #2 are not eligible for the Open Call Venice Architecture Biennale #3 presentation budget. The proposal can be submitted up until Thursday 15 March 2018 via the Fund's online application environment. In the pull-down menus select the 'Open Calls' option, then the 'Venice Architecture Biennale #3_Presentation budget'. Please note: Request your login details for the online application environment in good time and familiarize yourself with the application form. Validation of a new user account can take up to one working day. • appendix I: a concise and coherent project plan (PDF document in A4 format, max. 8 pages and no larger than 10 MB). You will find a pro forma plan containing all the required information via this link. If a submission is not complete, no evaluation can take place. •	the extent to which content and project form reinforce each other and are distinctive in this respect. The evaluation takes the form of a tender: a number of proposals will be prioritized within the available budget. The Fund will only communicate about the selected proposals and will enter into no correspondence about the rejection of individual proposals. •	for this Open Call there is no opportunity to submit a draft proposal to the Fund for feedback. For questions about the Open Call and the application procedure, please contact: Gabriella Fiorentini, Grant Programme for Architecture, g.fiorentini@stimuleringsfonds.nl, or 010-4361600. This Open Call's procedural and legal basis is set out in the Creative Industries Fund NL's Subsidy Regulations and the Grant Programme for Architecture.